If you're setting out to make sweet potato pie for the first time, don't let the grocery aisle confuse you. The beautiful orange colored pies that you see in photos are what the grocery store labels as yams. In fact, what the supermarket calls yams are actually an orange variety of the sweet potato. Sweet potatoes come in several varieties: orange with reddish orange skin, white or buttery with purple or tan skin and purple (more rare) with purple skin. 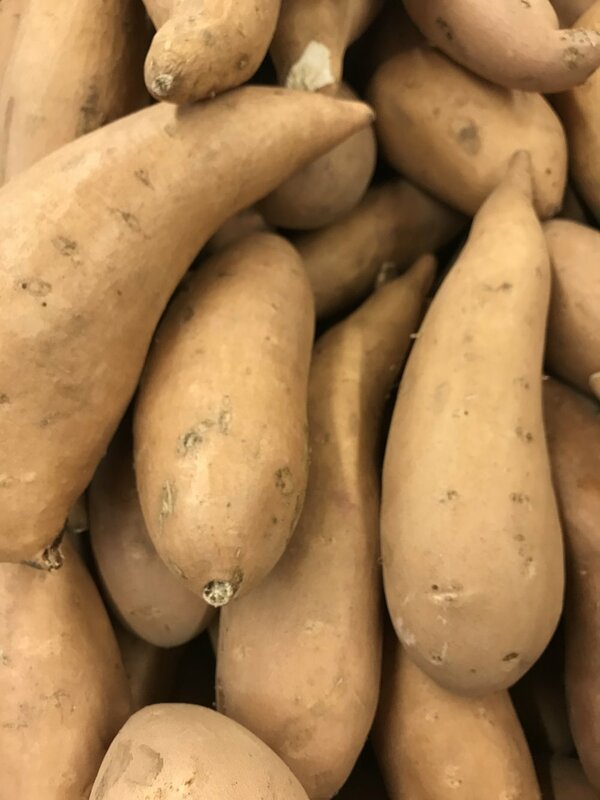 The sweet potatoes with white flesh are sometimes referred to as Okinawa sweet potatoes, while the purple skinned, buttery fleshed sweet potatoes are commonly knonw as Japanese sweet potatoes. When sweet potatoes and their many health benefits are discussed, it is usually the orange, sometimes purple fleshed sweet potatoes that are being referred too. The purple variety has the highest level of healthy antioxidants. The orange variety is also higher in antioxidants than the white variety and high in B vitamins. Sweet potatoes are generally high in fiber, vitamin C, copper, manganese and potassium. Orange sweet potato, often referred to as yams in supermarkets. The purple has a compound called anthocyanins which give the purple sweet potato its color and a powerful boost to health. The white varieties are more starchy and less sweet than the softer orange sweet potato. The orange variety of sweet potato is also one of the richest sources of beta carotene, which the body converts to vitamin A. White sweet potato. It's not always easy to know what color the flesh on the inside will be. Compared to the standard potato, sweet potatoes grow better in hot weather than cool. 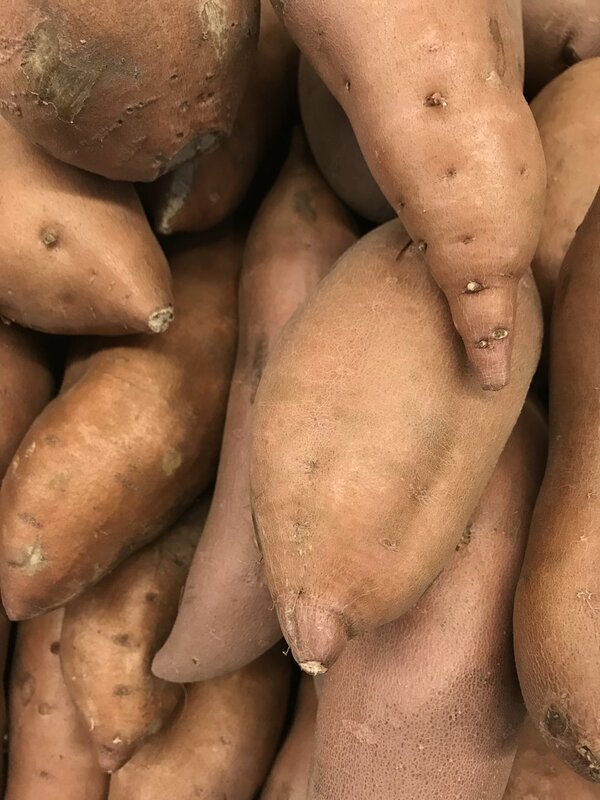 Not to be confused with the white potato, the sweet potato is a member of the bindweed or morning glory family of tuberous roots, where as the former is a part of the nightshade family. Interestingly, George Washington was a sweet potato farmer before he became a general. At most, if not all supermarkets across the U.S., the orange variety of sweet potato is called a yam. If it's being labelled according to federal guidelines, it will be called a yam sweet potato. But a true yam is native to Africa and Asia. It has a skin that is more like bark and a white flesh. The sweet potato on the other hand originated in Central America and traces its roots all the way back to the South Pacific in 1200 A.D.
Sweet potatoes are great as a side dish or meal roasted, steamed or boiled and mashed. They have increased in popularity in the U.S. as more people are realizing the health benefits and ease of preparation. Per capita consumption increased to 7.2 in 2016 from 4.7 in 2006. North Carolina is the largest producer of sweet potatoes in the U.S. Globally, China produces the more sweet potatoes than any other country for livestock and human consumption. Not a yam, the sweet potato makes a great pie. For a pie, the sweeter and softer orange variety is often preferred. I made this pie with white sweet potatoes. I had some sitting on my counter that needed to be used. Recipe adapted from Super Healthy Kids! Preheat your oven to 400˚ F. Peel your sweet potatoes and chop them into small cubes. Spread the cubes on a baking sheet with an edge, add water to the bottom of the tray to keep the cubes from sticking and add moisture. Then bake for 20-30 minutes. Check to add more water if needed to maintain a thin layer on the bottom of the pan. Using a wooden spoon, mix together oats, flour, coconut flakes, salt, and coconut oil until small balls form. Slowly add in cold water until the dough starts to come together but isn't sticky. Add more water/flour if needed to form a ball. Try not to mix more than you have to. Place the dough in the fridge for a half hour while potatoes are baking. After 30 minutes, roll out the dough to the size of your baking dish. 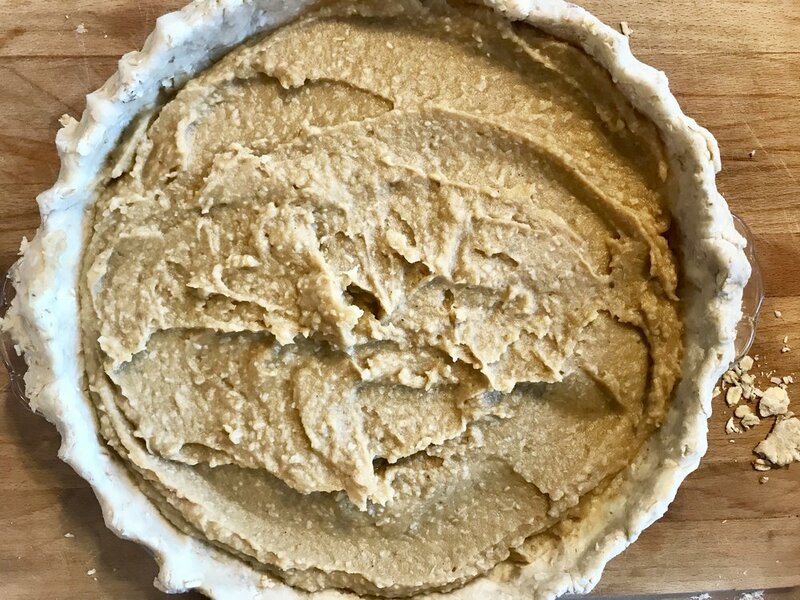 Use extra coconut oil to grease a 9-inch deep-dish pie dish. Press the pie dough into the dish so that it covers the bottom and sides evenly. Crimp the edges with fingers or a fork. Place in the fridge until ready to fill. Once sweet potatoes are cool, place them in a bowl and mash before mixing in remaining ingredients, OR add to a blender along with your spice, eggs, coconut sugar, coconut milk and coconut flakes and blend until the mixture is smooth and all elements are combined. Add the mixture to your ready pie crust and dish. Bake for 40 minutes at 375* or until a toothpick comes out clean from the filling and the crust is browned. Sprinkle coconut flakes on top when you pull it out of the oven. Tip: If the crust or coconut are done before the filling is done, place a piece of tin foil lightly over the top of the pie to prevent burning. Allow to cool before serving! Let me know what you think! I used Kämen Foods organic cold pressed coconut oil for this recipe! Shopped directly through Treatmo App. Get to the yum faster by mobile. Try it here on iTunes.